Biasiswa.net - Providing the latest international scholarship information on the net. Google is offering scholarships to students with disabilities to pursue Bachelor's, Masters or Ph.D. program at any university in Europe. 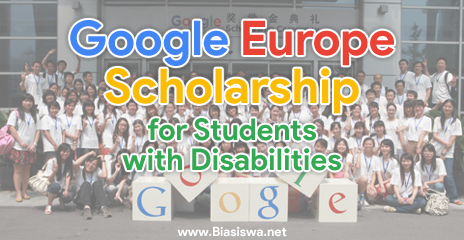 The applicants for Google Europe Scholarship for Students with Disabilities, 2017-2018 should currently be enrolled at a university in Europe. The candidates should intend to enroll or should be accepted as part-time or full-time students in Bachelor's, Masters or Ph.D. program at a university in Europe. The applicants should be pursuing their degree in the fields of Computer Science, Computer Engineering, Informatics, or a related field. The candidates should have a strong academic record, leadership skills, and a passion for computer science and technology. The applicants should have a disability. The candidates applying for Google Europe Scholarship for Students with Disabilities, 2017-2018 should submit a curriculum vitae and background information. The applicants should also submit academic transcripts, a letter of reference from an instructor or professor or supervisor and responses to essay questions. Value of the scholarship: The recipients of Google Europe Scholarship for Students with Disabilities, 2017-2018 get Euro 7,000. Application deadline: 1st December 2016. Disclaimer: All Content, Logo and Company names are trademarks or registered trademarks of their respective holders. Use of them does not imply any affiliation with or endorsement by them. Copyright © Biasiswa. All rights reserved. Your Links Here Link. Link Here.